Although Mount Rushmore is the centerpiece attraction in South Dakota’s Black Hills, there’s much more to see in this often overlooked vacation spot. Truth be told, most folks haven’t a clue of what the area has to offer. In fact when I was sharing some Black Hills photos with a friend, she immediately wanted to know where I saw that bison herd and the location of that one-lane tunnel with the breathtaking view. And when I told here those sites were all just a short drive from Mount Rushmore, she almost dropped her teeth. The Black Hills area also offers good news for wheelchair-users and slow walkers, as even though it’s a bit off-the-beaten-path, it still boasts good access. There are some great scenic drives in the area, and you don’t even have to get out of your car to enjoy the view. On the other hand, if you want to explore the area on foot and get up-close-and-personal with Mother Nature, there’s plenty of accessible opportunities for that too. Either way, the Mount Rushmore area provides a very scenic cultural experience, good access and some wonderful photo opportunities. 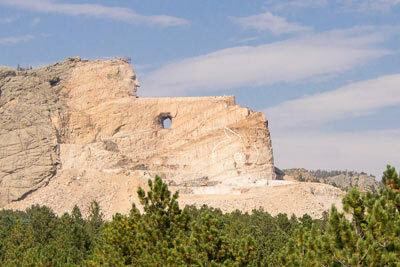 Located just 35 minutes from Rapid City, Mount Rushmore (605-574-2523, www.nps.gov/moru) is a must-see on any Black Hills itinerary. Sculpted by the father-son team of Gutzom and Lincoln Borglum, this massive work took 14 years to complete. Today visitors can get a good view of the four presidents —Washington, Jefferson, Roosevelt and Lincoln — from just about anywhere in this national memorial. 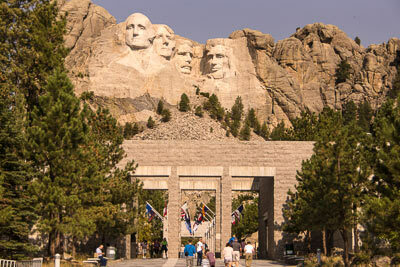 Although there’s no entrance fee to Mount Rushmore, there is an $11 parking charge. The bad news is, since it’s not an entrance fee, the America the Beautiful Access Pass — or any other national parks pass — is not accepted. The good news is, the parking pass is good for a year, so you can always come back a few times during your visit, or even return for the evening light show. Accessible parking is available near the elevator, with ramp and elevator access up to the main level. Additionally, there’s a drop-off area right in front of the entrance. Loaner wheelchairs are available at the Information Center, which is located near the main entrance, just across from the restrooms (which are also accessible). There is barrier-free access down the Avenue of the Flags to Grand View Terrace, where you’ll catch your first glimpse of the four presidents. From there, take the left entrance to the Presidential Trail, which travels past the Lakota Indian Heritage Village to four alcoves with optimal views of each president. The trail is paved and level, and the accessible portion ends at the Upper Terrace, where you’ll get another good view of the mountain. From there you’ll have to double back, as it’s downhill with lots of steps along the rest of the trail. Still, the quarter-mile accessible stretch offers the best views of the monument. There’s also elevator access to the amphitheater and the Lincoln Borglum Visitors Center, on both sides of Grand View Terrace. And if you’ve worked up an appetite, the cafe along the Avenue of the Flags is wheelchair-accessible. Be forewarned though, this is a very popular attraction, and it tends to get quite crowded during the day. Best bet is to visit first thing in the morning, when it’s relatively empty. From Mount Rushmore, it’s only a short drive down to Custer State Park (605-255-4054, www.custerstatepark.com), however it’s one of the most scenic drives in the state. Just follow the signs back to Highway 16A, then head towards Custer State Park. Along the way you’ll pass through three one-lane tunnels, and get some absolutely gorgeous windshield views of the scenic Black Hills. Have your camera ready as you exit the second tunnel, as it’s a great vantage point for the iconic shot of Mount Rushmore. Be sure and stop at the Visitors Center, once you get to Custer State Park. There’s level access to this 1935-building, which was built from used rocks and logs in the park. Inside there’s a number of interpretive exhibits, as well as an information desk. One of the biggest attractions in the park is the herd of 1,300 bison. The best place to get a look at them is on the 18-mile Wildlife Loop Road, which is located near the east park entrance. You’ll find all sorts of wildlife on this road; and it’s not unusual for the bison to be right alongside, or even in the middle, of the road. A word of warning — roll up your windows when you see the burros, as they’ll stick their heads in your car and pretty much grab whatever they want. 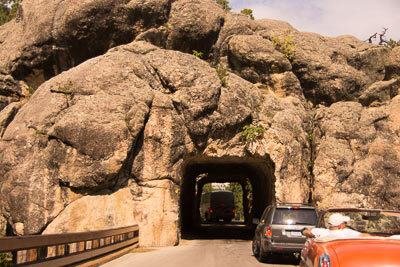 Although many people just continue along highway 16A to Custer, the Needles Highway Scenic Drive is the better way to exit the park. Just take a right on Highway 87 and follow the signs. Named for the needle-like formations and cathedral spires that dot the landscape, the route traverses a Ponderosa Pine forest and passes through three narrow tunnels. There are lots of accessible places to stop and enjoy the view, but make sure and use the pullout right before tunnel five, for a great view of Little Devil’s Tower and Cathedral Spires. After that, you’ll get up-close-and-personal with the spire-like formations, as the road cuts right through them. It’s a once-in-a-lifetime drive. Once you reach Highway 16, you have a choice. You can go left and visit the Crazy Horse Memorial (605-673-4681, www.crazyhorsememorial.org), or go right and return to Rapid City. Even if you don’t want to visit the memorial, you can still get a fairly decent view of it from the highway; but if you’d like some background information on the project, or you want to visit the Indian Museum of North America, you’ll have to pay the $10 per person admission charge. Accessible parking is available near the entrance, with level access to the Welcome Center, and loaner wheelchairs available inside. There is level access to the theater — where an introductory movie is shown — with wheelchair-spaces and adjacent companion seating. From there, there’s level access to the outdoor viewing platform, where you’ll get the best view of the memorial. Chiseled out of the mountain, much like the four presidents, this likeness of the great chief astride his horse is a work in progress. Although carving a sculpture of someone who was never photographed would seem to be problematic, sculptor Korczak Ziolkowski considered the work more of a memorial to Crazy Horse’s spirit, rather than a true depiction of his likeness. Either way, it’s a massive work, and when completed it will be the largest sculpture in the world. And if you’d like a closer look, there’s also a wheelchair-height scope on the viewing platform. Save some time to visit the Indian Museum of North America, which has a large collection of photos, headdresses, pottery, weapons, clothing and baskets. And if you’d like to take home a souvenir, there are plenty of Lakota artists and craftspeople selling their creations throughout the museum.